I'm (Claire N) sharing with you today my calendar page for May. I'm really pleased how this project is coming along. We are nearly half way through, and even now I am enjoying looking back over the last months to see my mood and style that has been captured. I am creating the entire calendar, firstly to be used during 2016, and also with someone in mind to gift this too. Do you do that, just keep papers without using them? I do, I get just as much pleasure from looking at them and re-arranging them, then putting away again. Anyway, I was compelled to use them today because they are absolutely perfect for any photographer. May is the month when Spring is in full swing and all the birds and flowers are bursting into life and ready to be captured on film again, and I know Dad is ready to get out and about again with his camera. As mentioned before I have used papers from the the papers kits Sarah sent out monthly. 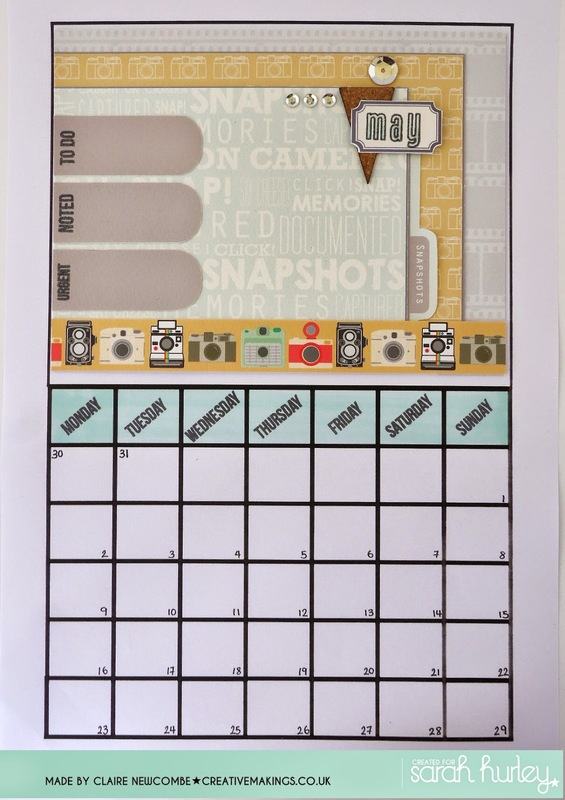 Sarah has some camera themed digi stamps available here also that would tie in nicely. I have embellished the layout with little accents (sequins and cork shapes) that I've collected along the way from Sarah's fabulous selection of embellishments, found here. Then used the block alpha stamps to stamp the 'May' tag. How are your calendars coming along, we'd love to see if you are willing to share. 10 Minute Makes - Congratulations Card. "Be Amazing" 10 minute make.